Property 12: Luxury River Front Cabin Hot Tub, Large Game Room, Fire Pit by the River, WiFi. Property 14: Riverfront home w/ hot tub, firepit & wrap-around deck - dogs welcome! Property 15: Shady Hollow--Romantic Couple's Getaway with Hot Tub, Internet, and Cable! Property 20: Shady River Retreat -- Your Riverside Paradise! Property 36: Cabin with Creek, Outside grill, Fire pit, Wifi. Book 7 days for great discount. 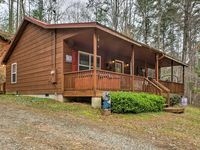 Property 37: Waterfront Cabin with Deck for Trout Fishing & Sun Bathing - Canoe Provided! 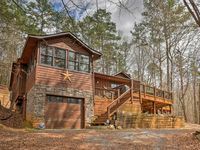 Property 48: Cabin in the woods w/ private hot tub, views, paved road access - 2 dogs ok! Property 50: Pay for 2 nights, get 1 free! 3/2 DEER Galore!